Antonia discusses, with Jan, her decorated stone at the base of the south dresser in Structure Ten. 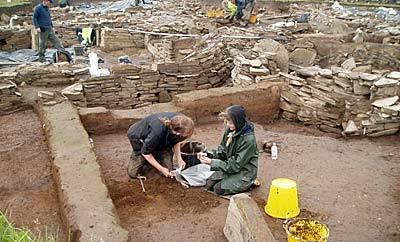 Trench T, the new one on the far side of the house from the main site, is living up to the family tradition. In other words, it is proving to be just as complex, infuriating and downright puzzling as the rest of the Ness site. The revetments around the large mound at the very tip of the Brodgar peninsula, which the geophysics strongly suggested, are still elusive! The potential wall, which curves across the middle of the trench, is now looking rather insubstantial, which may suggest that it is a later insertion. 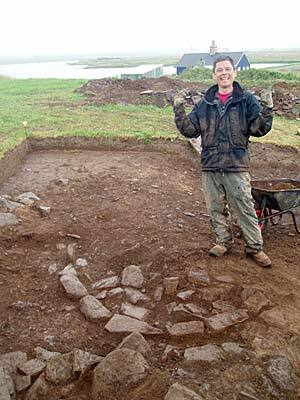 Towards the top of the trench, Ben uncovered a very neat sub-circular feature, which looks equally alien. It could be a later inserted burial and it just doesn’t have that Neolithic look. The cup decorated stone discovered by Colin. On the other hand, the nicest find from the trench thus far is part of a delicate, little thumbpot which, judging by those already found in the main trench, is irrefutably late Neolithic. Further down the trench, Keir has also found what is potentially a fragment of macehead. 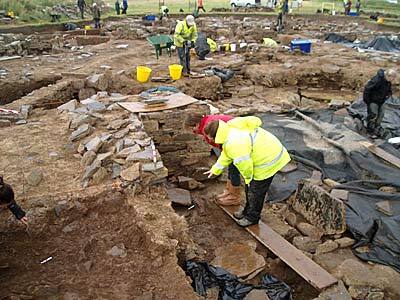 All very puzzling, but we may have to wait a little longer for clarification as the University of the Highlands and Islands students working there have been hauled over to the main trench to experience the joys of planning. Georgie and Colin have had an interesting day. They removed the last of Structure Seven expecting to find Structure Nineteen below. Instead, they have uncovered a paved alcove and it is now possible that Structure Nineteen is not a structure at all but is an external hearth with associated features. However, there is still the possibility that this alcove is, in fact, an intermediary level within the sequence of levelling for Structure Seven — life is never easy at the Ness! 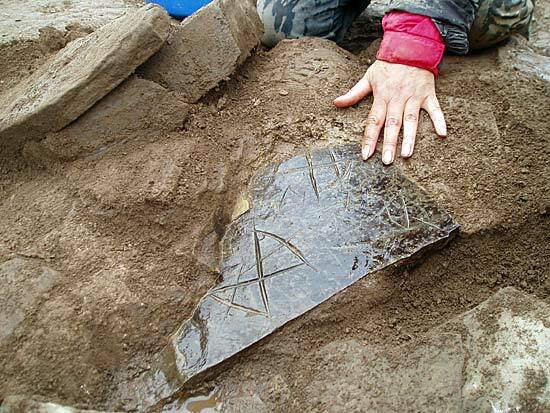 As consolation, and while working on the floor level, Colin uncovered a nicely executed decorative slab, with four pecked dots, built into the back of the partially robbed out wall of Structure Eight that had been removed for the construction of Structure Seven. In Structure Ten, the sequence of later corner buttressing is being revealed in the south-western corner and Jan, while removing the last of the south dresser, found a slab on the bottom decorated with nice little geometric motifs. Sarah continues to prepare the Structure Ten floor for the all-important sampling process. Owain and Nela in the middens outside Structure One. In the midden between Structures One and Twelve, and attempting to discover the direct stratigraphic relationship between the two buildings, is our own anniversary couple. In a jaw-dropping example of devotion to duty (and each other), Owain and Nella spent part of their honeymoon last year digging at the Ness (the Ness’s first wedding!). At Nick’s suggestion, they proved today that it is possible for two experienced archaeologists to dig together holding hands. It would, perhaps, be a bad idea to encounter a delicate piece of Grooved Ware pottery while working like this, but at least they have shown it can be done. We may now suggest that all couples working at the Ness should follow this example. The unexpected relationships thus revealed may, however, be just too embarrassing for words. Not, perhaps, the greatest idea. The best has been saved for last. Joanna has been clearing the remnants of the exterior blocking to the later entrance to Structure Twelve’s annexe. While trowelling back midden from a stone she revealed the most striking piece of rock art we have seen for a while. It is on a slate-like slab and features very large, and deeply incised, crosses, shaped like butterfly wings. 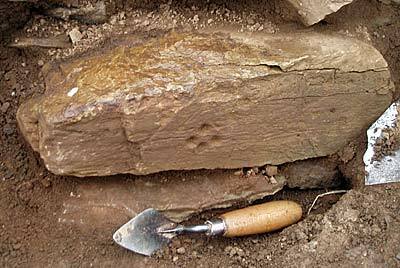 This motif has been seen before at the Ness and may, indeed, become the signature motif for the site. The stone has been broken, which means that more of it may be lurking nearby. Fingers crossed! The fabulously incised slab discovered by Joanna. Ben seems pleased with the discovery of the strange circular feature in Trench T.
This view, from a novice digger, and very recently retired psychiatrist and child-protection doctor, is coloured today by a lot of mud and a disconcerting wordlessness that suddenly followed from being whisked from muddy midden to laptop, with just a brief lunch in between. This seems to mirror the transitions occurring in my life from professional to retiree, choosing once again how to spend my time, including muddy interludes! Relieved that, so far, the thunderstorms from the south have not reached the Ness, I am happy as the proverbial pig wallowing in Neolithic wonders and in the fine company of as diverse a group people as you could hope to meet — from professional ‘old’ hands, students from a global archaeological reach and the volunteers. I am not the oldest, and definitely not the fittest — although after six weeks I will probably be fitter than I could have possibly imagined. There are surprising parallels between probing back into the life of this incredible 5,000-year-old community through their debris, buildings and precious objects, and my former work of piecing carefully through the emotional debris, trauma, abuse and pain of individuals and their families where meanings and origins are obscure and hidden, until they can be teased out into the open and worked on in a metaphorical “finds” shed. Here the pain is mine and physical after a lifetime’s worth of armchair working. This week has started to bring tangible rewards for the herculean labours of stone, sandbag and tarpaulin removal and the mattocking that preceded the emergence of virginal stone courses in the new Trench T last week: now there are finds of bone, pottery and flint tools from my bit of midden. I felt that I fully ‘fledged’ yesterday with three small finds, one of which had a fine “grooved” rim. I peer at the incised stone edges found by others and admire the lovely worked stones that turn up in corners here and there. I am as muddled as hell by the structures and levels and what it all means; I suffer in the evenings for the toil and take copious ibuprofen; but, by day, I am just swept along by the excitement of it all and the privilege of being part of it. Thanks Nick and the team and Rachel [who was once part of my team] for facilitating my time here in Orkney’s Neolithic heart.